Travelling in the true sense of the word. Free, without the encumbering backpack of thoughts, thoughts of a house back home, thoughts of a garden neglected, that was the luxury of our travelling. 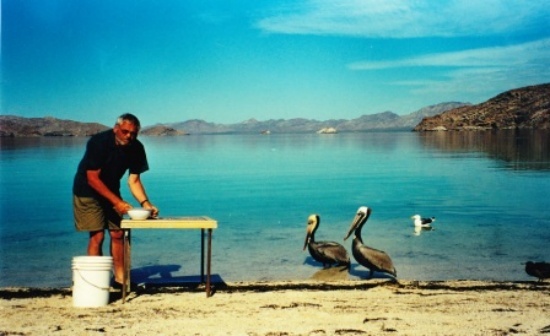 We had come from California and travelled through the North of Baja California with our old fashioned Dodge camper. 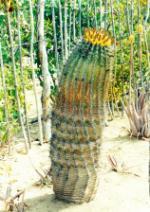 We had left the bush land of succulents behind us and were on our way to San Ignacio. Spring had touched the earth and spring flowers grew timidly by the side of the road with more and more plantations of date palms and citrus trees, the first being planted by the Jesuits in 1726. 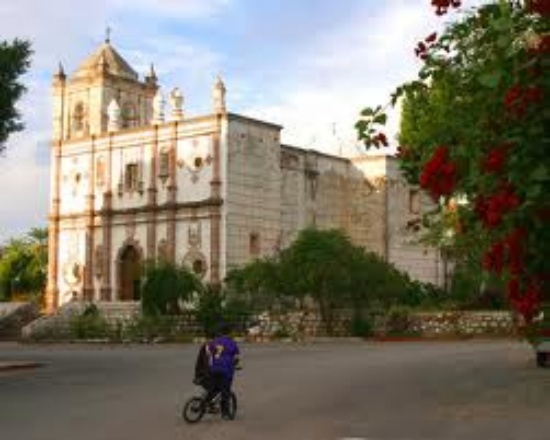 San Ignacio, a small town in a sumptuous green valley rich with water with the famous church from lava rock built in 1786. 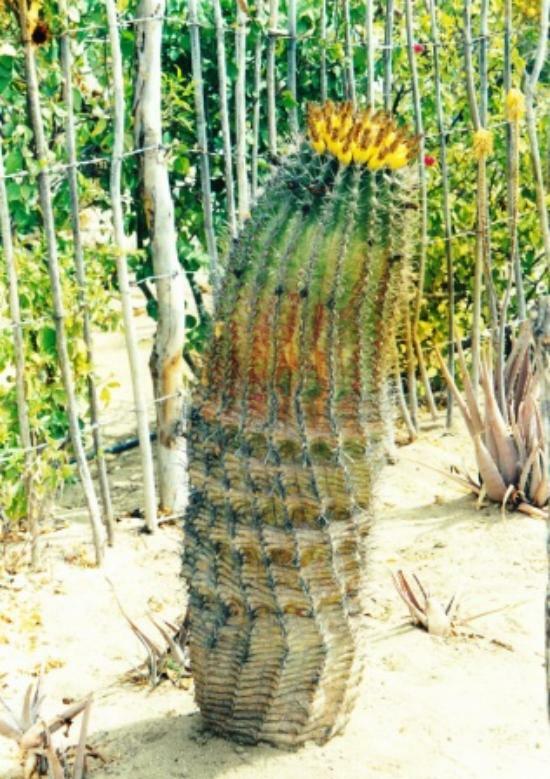 Here our first Zocolo in Baja, that is how a village centre in Mexico is called. We had our first flat tyre here caused by a nail, and had to leave our camper outside the village. 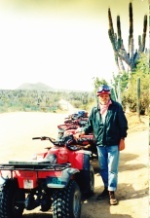 But since we had our bikes with us at the back of the camper the matter was soon settled for just $ 6.00. Show me the Mexican who cannot repair anything wrong in a car, these mechanics are most inventive. Everywhere palm trees and bananas as we cycled through the village. There is an interesting museum with photos of paintings done by the natives 5000 years ago. Returning to the Zocolo we sat down among some women with their shopping bags between the knees watching their grandchildren play, some old men bent with their knotty hands in their lap, doing nothing but watch the time go by. We talked a little. A girl approached me and asked if she could have a ride on my bike and I said: Climb up I’ll lead you, your grandmother would be mad at me, if I’d let you go by yourself. Later we tasted the nice red wine made locally. We were on our way to the east towards the Sea of Cortez with the Tres Virgenes with 1920 m (Three (volcanic)virgins) in front of us. Mountainous steep and narrow roads again with flowers and signs along the side of the roads and probably many tears. 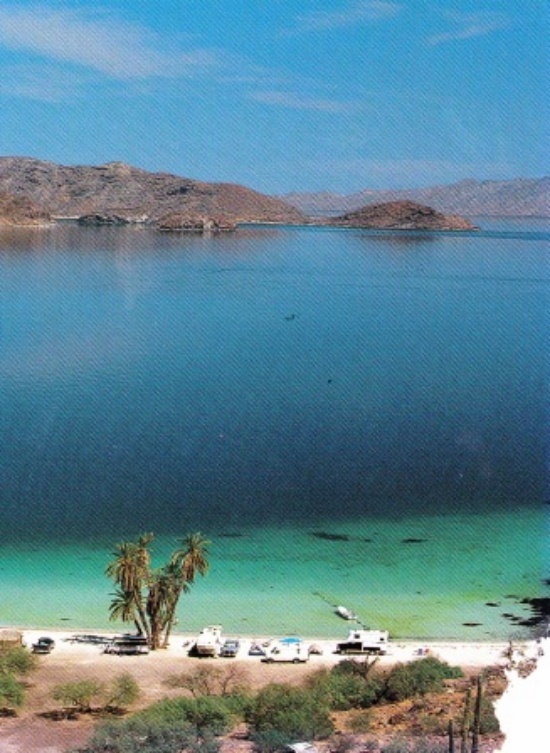 Santa Rosalia, once known for its mining for copper and manganese, completely dedicated today to tourism because it has a direct ferry line to the mainland. 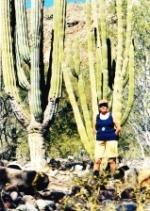 But our aim was to reach Mulege, a mystic word among travelers. 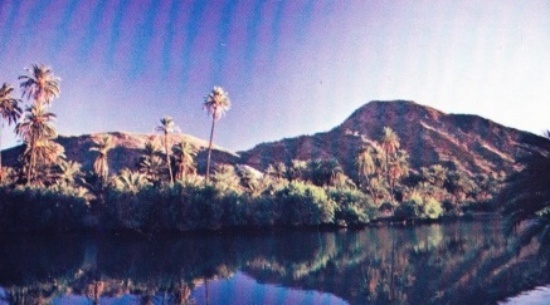 Its river coming from the mountains and flowing into the Sea of Cortez is dark green surrounded by palm trees and jungle like vegetation and populated by pelicans, and all kinds of water birds. At the mouth of the river by the sea is a fishing camp where fishermen live with their families without any comfort, no electricity or anything. But what do they actually need but a roof over their head and a shop which is close by behind the football field. The families and kids come to join their father for the school holidays; usually they live in other places. There is an airstrip for sports planes and one quite comfortable hotel, very Mexican. 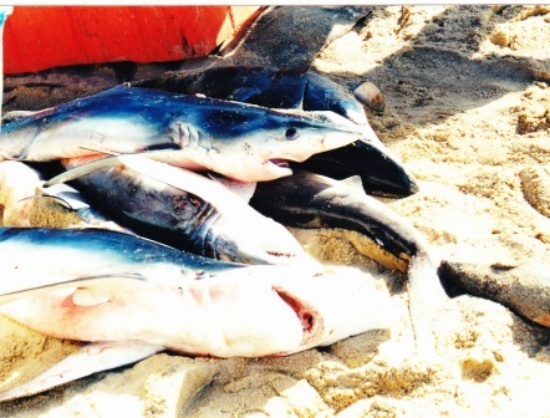 Fishing tourism. That is where we camp for some days. Tropical trees and everything covered in giant bougainvillea. There was a smell of fish in the air. 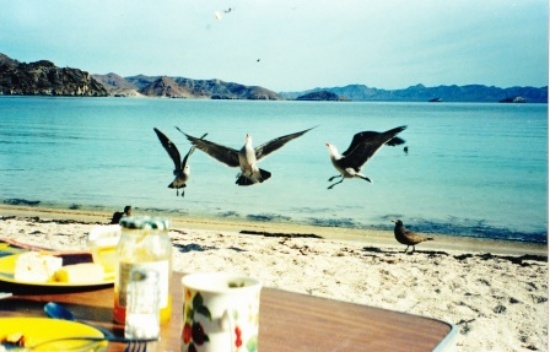 Birds came circulating over the harbour and called us to join them. It was late afternoon, and the sun was setting in a purple bed . 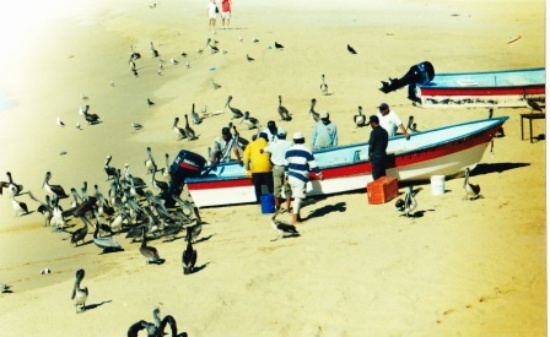 The last fishermen came in with their boats deep in the water loaded with fish followed by screeching water birds: pelicans, cormorants, vultures, frigate birds and seagulls. A weird scene. so unreal! The women came down from their quarters and joined their men. Now the slaughtering began. Mostly sharks. The gilled corpses were thrown on the quay which had become slippery with blood, the entrails thrown to the birds, sometimes high into the air for them to catch, and they did. The fins it was what they cut off for export to Japan, the rest was to make steaks from that would be delivered to the hotels. I was one part disgusted one part fascinated, this was life in its raw image and function. From where we camped, for several miles towards south, was a completely deserted beach, rather virginal and the next day we walked along it for six hours, me with my rucksack. I could not believe the richness of my finds, shells you can only dream of, conches, star shells, tritons, cowries and sea snails such as Murex, olives and marginellas, worm shells, oysters, even some paper nautilus and chambered nautilus. I brought home a rich collection and while the sun was setting, this time in blood red, I washed my shells and left them to dry. I didn’t tell my husband that there were some more treasure nests on the beach which I meant to collect the next day. We took our bikes to explore the area, along the river romantic houses hiding under the roofs of palm trees, kept very simple and built from bamboo and wood beams with straw roofs, the homes of rich Americans and Mexicans. Very close is the old Missionary Station Santa Rosa, early 18th century, and the village life is simple with one supermercado, no hint of mass tourism, I think, the rich inhabitants want to keep it this way. Some artists perhaps. And a shop for fishing gear, of course. 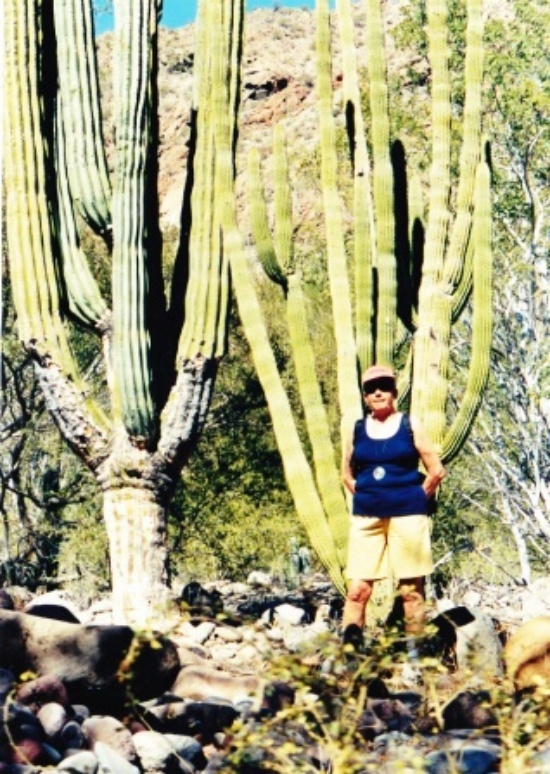 From Mulege which we hated to leave, we were drawn further south and then criss cross again, from the Sea of Cortez to the Pacific. Rocky bays with sandy beaches, hardly populated, where we met with some other caravan people, often here for many months, pensioners they call them I believe, grey or white birds; often they sell their houses and invest the money in a caravan and money to travel. There are whole communities of 1000s of caravans in Arizona organized into villages with church and cemetery. What a philosophy! Dropping out, usually from cold countries, away from their families where they are used as the whole day granny. We came across a couple in a small caravan who set up camp right next to us; he was a musician and she was blind, I was told. 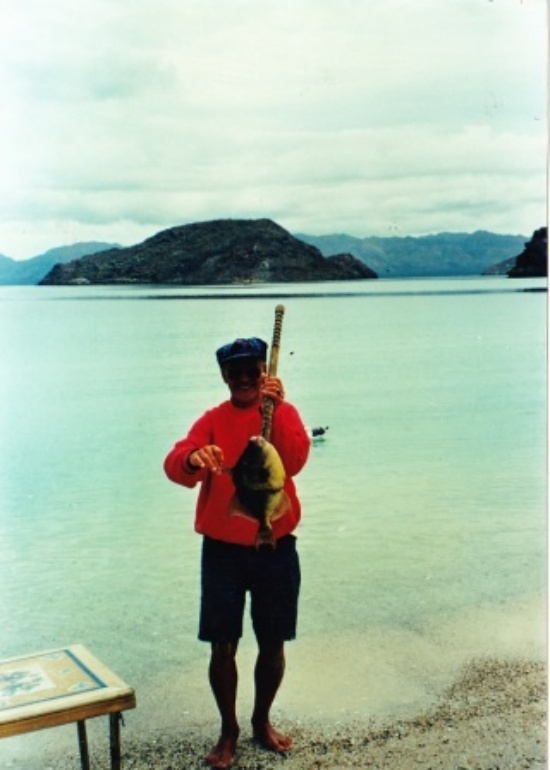 It was the dream of his life to travel and go fishing. She was making his life a hell, calling him to her side all the time and he had to do everything for her. Once a day he was allowed to go out in his boat, it was cold, but he wanted to get away, my husband helped him. By chance I saw through the back window of our camper into the inner cabin of our neighbour and there this woman sat, drinking from a big glass and playing cards. I called my husband and said: Look at this woman, she is not blind at all, she is cheating. Late at night we saw the man come in completely wet and miserable. The next morning they had left leaving the camp chairs behind. Usually people were not that crazy but they were at least special in many ways and I enjoyed that. 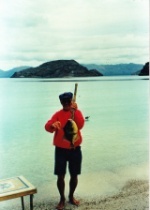 In many fish camps we shared the fish the campers caught and we joined them for talks at their camp fire. It was a wild life in a wild country so little regulated, so much suited for the adventurer type and since they were hardly any young people camping for a longer period, life was easy going and very peaceful. 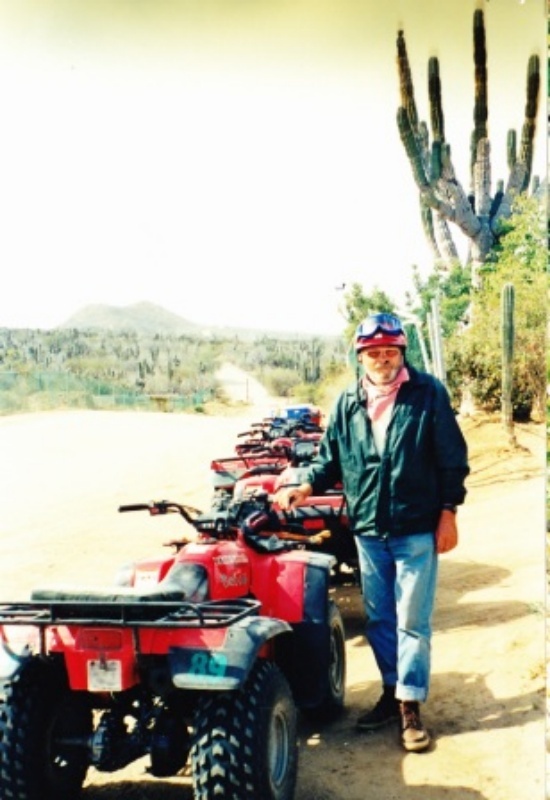 We arrived at the tip of the island, Cabo San Lucas, here was mass tourism with all sorts of activities; in one we joined to race up and down the dunes with four wheelers; it was not really to my taste but for the big boys. Many sailors come here on their way around the world. We had fun here in this remote touristic place but I preferred to move on to be alone again with this wonderful world I was sure I would never see again. 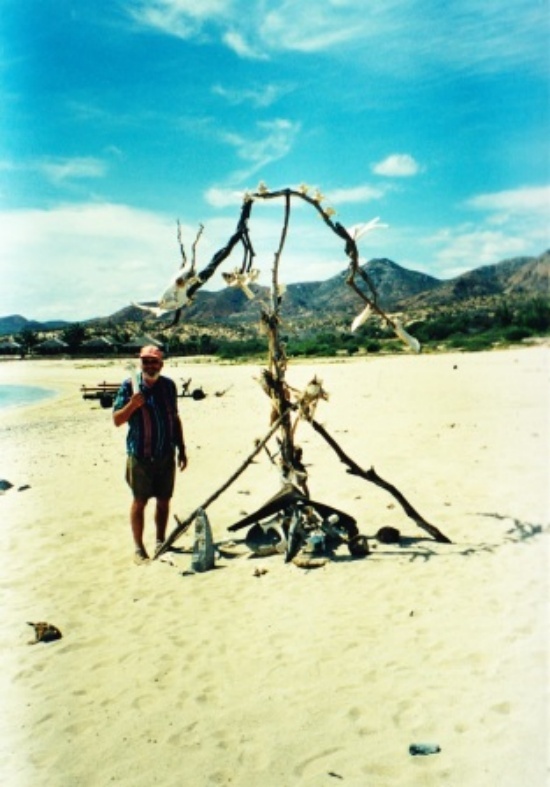 We moved up the eastern coast and drove through the mostweird places, we walked in the mountains to get a governing view and we walked endlessly on the beaches with their treasures left behind by the waves. We sat by full moon on the beach watching the boats on the water, endlessly. 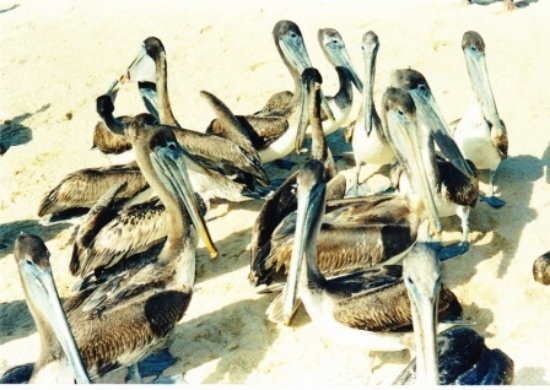 For breakfast you always had guests coming to your camp table asking for something, pelicans and beach runners. Pelicans out over the sea teaching their young how to hunt, like an arrow they were plunging into the water for the food they had discovered from high above, and this exercise goes on forever. 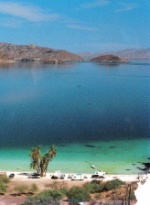 After four months we arrived at La Paz, the capital of Baja where we had booked a place on the ferry to the mainland. We shall never forget these months of absolute richness for ourselves. How good to know that there are still places on earth which give us a vague idea of what the world may have been like at its beginning, where an abundance of fish is around and where the inhabitants are happy, at least I have the impression they are.